It’s that guy again, huh? In a game that featured 21 lead changes and 19 ties, no basket was more important than Kelly Olynyk’s putback off a Dwayne Wade miss with 0.2 seconds to play in regulation to spoil the Wizards’ regular season opener, 113-112. The Wizards were looking for a fresh start to the season after last year’s shortcomings, and John Wall looked ready to provide it early. The All-Star reminded everyone what he’s capable of when playing on two healthy knees as he crossed over for a layup and hit a three in transition for the Wizards first five points of the season. Scott Brooks wants the Wizards taking more three-pointers this year and Markieff Morris took well to that message knocking down both attempts in the first quarter as Washington jumped out to a quick 17-6 lead. But as we’ve become accustomed to with Brooks, he went with the dreaded all-bench lineup that brought the Wizards’ offense to a screeching halt as Miami trimmed the lead to one, 25-24 after the first quarter. To no surprise, Brooks stuck with the reserves to start the second quarter until the 8-minute mark. For as great as the first nine minutes of the first quarter was for the Wizards, the final eight minutes of the second quarter were equally as bad. Poor defensive effort, missed free throws, and a slew of fouls allowed Miami to hang around. Even with all the mishaps, the Wizards somehow led 59-58 at halftime. That poor play carried over into the third quarter as the Heat went on a 7-0 run to take a 69-62 lead. Midway through the third period, Jason Smith and Hassan Whiteside dove for a loose ball resulting in a tie up. John Wall ran right at Derrick Jones Jr. and had some words for him as he swiped the ball away from Smith. Wall picked up a technical foul, because, does the game really count if the Wizards don’t get a technical foul? Washington bounced back with a 10-0 run and regained the lead, 87-85 after three quarters. The teams traded baskets and free throws for most of the fourth quarter but the Miami Heat came up with the big plays when they counted. And more importantly, corralled loose balls (i.e. Olynyk’s offensive rebound) and hit their free-throws. This was an all too familiar ending for a team who looked awfully similar to last year’s underwhelming squad. John Wall will be under a magnifying glass this season and specifically, his knee, but he didn’t disappoint tonight. 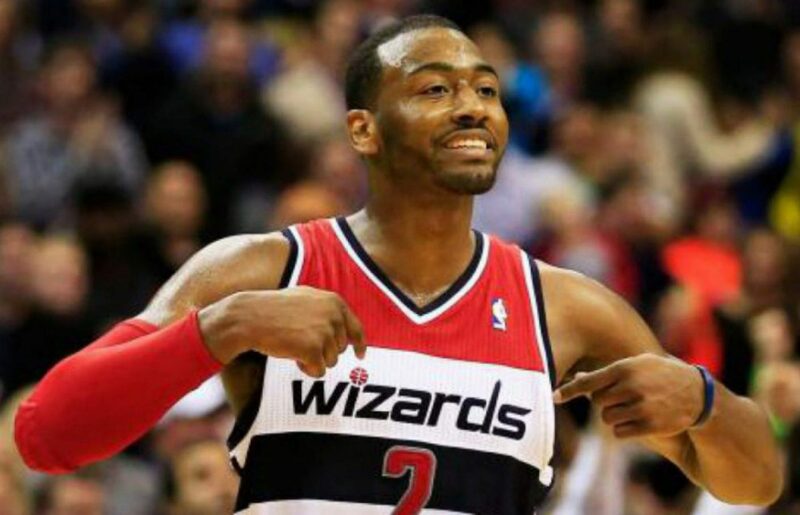 Wall scored a team-high 26 points to go along with 9 assists in a typical John Wall game. On the very first play of the game, Wall crossed over for an easy layup at the rim. Next time down, he pulled up for three giving Washington a 5-0 lead in the blink of an eye. But it wasn’t just his scoring early on that was impressive; it was his effort on the defensive end in the first quarter. Wall looked much more energized on the defensive end resulting in deflections and fast break opportunities for the Wizards on the offensive end. Wall was the only Wizards player to score in double digits in the first half as he notched 18 points on 8-of-10 shooting through the first 24 minutes. That aggressiveness carried over into the second half as Wall fearlessly attacked the hole and looked like his old self getting out in transition. Outside of a few missed free-throws, there’s not a whole lot to complain about from Wall tonight. Many think this year’s bench is the deepest Washington has had during the Wall era. We got our first taste of the all-reserve unit at the 2:55 mark of the first quarter with the Wizards up 19-13. After a nice drive from Austin Rivers, the Washington offense sputtered with Miami outscoring the Wizards 11-6 the rest of the quarter. The Wizards carried a 4+ minute field goal drought into the second quarter allowing Miami to tie the game at 33 just minutes into the second period, which forced Brooks to start reinserting his starters. The All-Reserve unit was a bit better in the second half but still, nothing to write home about. Regardless of who’s on his roster, it doesn’t look like Brooks is going to change his substitution patterns. Ian Mahinmi played well in the first quarter but outside of that, the Wizards didn’t get much production from the true center position. Mahinmi and Jason Smith each ended the night with four fouls and were glued to the bench in the second half as neither were viable options. Jeff Green played terrific tonight as a fill-in at the center position but this won’t be a long-term solution for the Wizards evidenced as they got crushed on the glass, 55-40. It doesn’t look like Kelly Oubre is going to take that next step. He was 2-of-8 from the field. The Otto Porter debate will continue all season long. He snagged 11 rebounds but didn’t attempt a single 3-pointer. John Wall is the Wizards best post defender. The Wizards have a huge hole at the center position. Bradley Beal’s head-scratching free-throw issues continue. He was 4-of-6 at the line. The Wizards will probably lead the league in technical fouls this season.